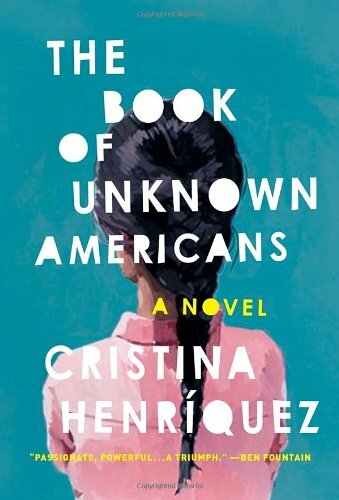 Inspired in part by the We Need Diverse Books campaign, I recently decided to be more intentional about seeking out books written by non-white authors, and thus when The Book of Unknown Americans appeared on BookPage's Top 50 of 2014 list, it seemed like the perfect place to start. I considered myself a feminist before I even needed a training bra, so it's been second nature to me to gravitate toward books written by women, but I realized that increasing my cultural literacy requires (and deserves) a focused effort. For some reason, a lot of the recommendations I found for books by minority authors were titles published before I was born. There's nothing wrong with those books—I read Ceremony in college, and House on Mango Street when I taught freshman English, along with plenty of other classics—but where were all the books written, well, this year, for example? My primary interest these days is contemporary literature, stuff that's hot off the press, the pages practically steaming with relevance. Books like this one. I'm glad it made BookPage's list, and I'll certainly be on the lookout for more like it. The Book of Unknown Americans centers around a small community of immigrants in Delaware. They are from many different places—Panama, Guatemala, Venezuela, Puerto Rico, Mexico—and they all have very different stories that led them to the modest apartment complex where they now live. Sprinkled throughout the novel are short chapters from different neighbors' points of view, telling of the countries they came from and the risks they took to make a life in the US. Henriquez captures the various voices perfectly, forming even minor characters into unmistakable individuals. However, the book is more than just a portrait of the neighborhood. Henriquez zooms in close on two families: the Riveras and the Toros. Arturo and Alma Rivera have just arrived from Mexico on a visa arranged through Arturo's job. Their teenage daughter Maribel suffered a tragic accident back in their hometown, and the family left everything in order to enroll her in a special school. Maribel's parents will do anything to protect their daughter from further harm, but they can't always stop her from seeing Mayor Toro, a boy her age who lives in a neighboring apartment. Maribel tells him that he's the only person who really sees her since the accident, and her teacher says she's made great strides at school since their friendship began, but their parents don't understand their growing bond and do their best to keep them apart. The book's ending absolutely devastated me. I should have known that a book about the lives of immigrants wouldn't be a fairy tale, but I was totally unprepared for the gut-wrenching sadness I felt. It's obvious Henriquez had me completely believing in her characters—they were real people to me, and their pain felt real too. I don't usually seek out or revel in books that bring me down, but the way The Book of Unknown Americans affected me is, I think, a testament to its power and truthfulness.